In a former post on this site, we’ve talked about sensory development in young children. We discussed how certain materials can be used at daycare to help aid in sensory development, which involves all of a child’s senses. And in another post, we gave reasons to encourage play in early childhood. 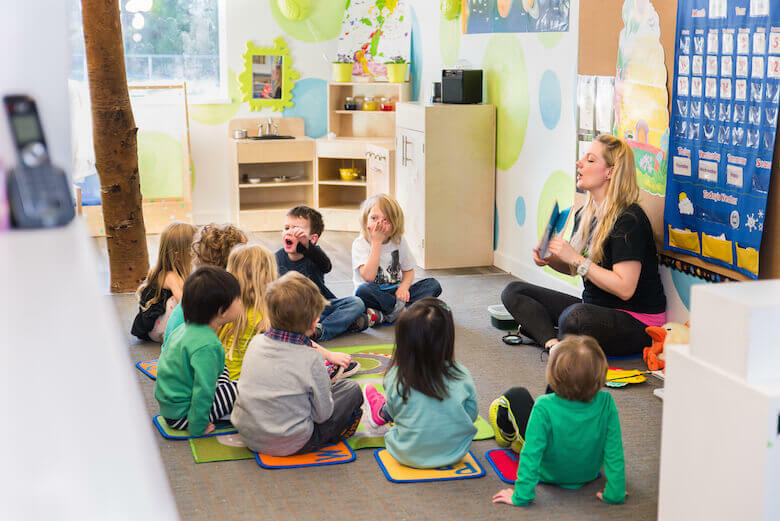 But in this post, we’ll delve into some objects that can be bought to help guide you in picking out educational toys for early childhood development. Although, this shouldn’t replace the idea of helping kids imaginations through art, or making toys, or using regular household objects as toys (like the laundry basket as a ‘choo-choo’ train). Keep in mind, we’re only mentioning a few here. The links throughout this article delve into more detail, and more examples. These are a classic, and probably all baby homes in Canada have seen them. The colourful plastic rings that stack on a peg – they are actually helpful for a child’s early development. Some now are textured to help a baby discover more about how different things feel. And aside from the dexterity needed to achieve the stacking on the peg, a child can also learn about colours, counting, and passing a toy from one hand to another, since the rings are easy to grab. The concept can then go on to include cup stackers, or hammer-and-peg toys, an abacus and so on. Be careful with this one if it’s for a young infant or toddler, as we know that babies like putting things in their mouth. We don’t want to create a choking hazard. There are some of the bigger lego blocks out there for the younger children who need an educational toy. Plus, the lego shape and concept is quite unique. A child can use their imagination to create several combinations of structures (more than they can probably imagine!). As this documentary trailer explains, the Lego “phenomenon” attracts all ages, and has inspired several creative endeavours. In fact, one person left his job as a lawyer, to be a full time lego artist! Plus, for your creative child working with this developmental toy, there are communities of lego builders and teachers out there, such as this website, and more you can Google. If you don’t want to use Lego blocks for any reason, it’s ok! Other types of blocks are great as educational toys, and can even help with understanding math concepts when a child enters school. Dolls and stuffed animals are so basic, it’s hard to get through childhood without being exposed to them. Even the popular movie, Toy Story was based on a doll – Woody, and his imaginative interactions with other toys that had personalities. Dolls can help a child play ‘pretend’ and use their imagination. They can also help with role play. As this website states, it’s important for children to explore emotions, and to learn social skills. Dolls can do that well for a child, especially since they can be played with in pairs or groups. And, this video by The School of Life explains the fascinating way soft toys can help a child work through emotions, by using extensive imaginative sequences. In a way, a doll can ‘come alive’ to a child. The child can talk to it, and experience love and comfort from it. While the video above talks about a case where a child had been abused, the principle is that many children use soft toys as a way to achieve mental ‘peace’ amidst stressful situations. And stress can come from ‘regular’ child life. Being afraid of the dark, for example, can be stressful. And so, a soft toy can help the child not be worried. The video then goes on to explain how these childhood relationships with dolls can affect how a person grows up to learn how to take care of themselves. Of course, we can’t write an article on educational toys without mentioning that there are nowadays several toys that use batteries and sound recordings to teach infants and young children. You’ve likely seen Leap Frog products that specialize in this type of learning toy. But Leap Frog is not the only company that makes these. Shopping for “learning toys” on Google will bring up entire sections from Wal-Mart and Toys ‘R’ Us. In fact, Toys ‘R’ Us has a toy section on their website devoted to the STEM subjects alone! Fisher Price, Vtech and Baby Einstein are some brands that produce these types of toys. For example, the Code-A-Pillar claims to help a child with critical thinking skills. However – and this is a big ‘but’ – these toys are not always beneficial to learning. Some have said they can actually hinder language development because they take out the human interaction needed for a child’s real development. And, this psychotherapist claims the effects of these toys is huge when it comes to real learning. This is an issue that has been reported several times. We encourage you as parents to do your own research on the subject. Should young children be using electronics and media? Remember, toys don’t replace people! It’s important to know that while educational toys can be good for a child’s development, they don’t replace your involvement in their life. This article on Scholastic.com’s Parent section explains, ‘20 Ways to Boost Your Baby’s Brain Power’ – and most of them involve you! Developmental toys were only one part of the equation. So remember, baby loves you and loves to play with you, not apart from you!